The appearance of hematoma on MRI depends on the oxidized state of the hemoglobin and iron and whether it is within or outside the erythrocyte, which in turn translates into factors such as age, location, and source of the hematoma. The term magnetic susceptibility describes the magnetic response or induced magnetic field that a substance generates when placed in a constant magnetic field. A diamagnetic material generates a weak field that is opposite to the applied field, whereas a paramagnetic substance produces an augmented induced field in the same direction as the applied one. Oxyhemoglobin like most body tissue, is diamagnetic with iron in the ferrous state (Fe2+); deoxy (Fe2+)/ methemoglobin (ferric/Fe3+) and hemosiderin (Fe3+) are all paramagnetic (45). Fig. 61. 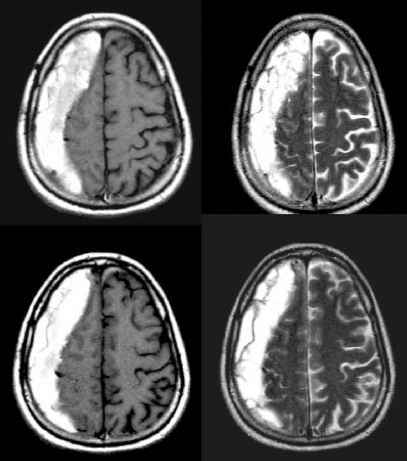 Axial noncontrast computed tomography (top left), T2-weighted (top right), gradient-echo (bottom left), and postcontrast T1 (bottom right) MR images showing a calcified large left medial temporal lobe cavernoma. Note that other, smaller lesions including the right periatrial area are only apparent on gradient-echo or susceptibility sequence. that was earlier termed irreversible nonstatic inhomogeneity does not affect T1 and cannot be corrected with the 180° RF pulse of the spin-echo sequence. In the context of hematoma, this T2 loss is owing to frequency variations produced by diffusing water molecules into and out of erythrocytes, resulting in phase incoherence and dispersing of spin signals. In terms of the selection of pulse sequence for imaging of hematoma, gradient echo is the most sensitive, with "blooming" caused by paramagnetic properties; one should be aware that the area of signal loss is in fact larger than the actual size of the hemorrhage. Fast EPI in either the spin-echo or the gradient mode is also sensitive to the susceptibility effects of hemorrhage, followed by CSE; FSE is the least sensitive among the various sequences. Fig. 62. Numerous small hemorrhagic foci in the brainstem, splenium of corpus cal-losum, and gray-white junctions on gradient-echo images in a patient with diffuse axonal injury. Fig. 63. 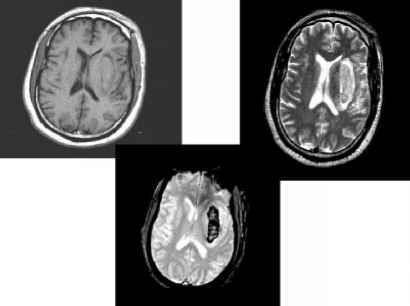 Axial noncontrast T1 (top left), T2 (top right), and gradient-echo (bottom) images of acute hemorrhage at the oxy-deoxyhemogloblin stage being isointense to brain on T1 and iso- to hypointense on T2. with the extracellular plasma thus resulting in signal loss on T2 images. In fact, the hypointensity on T1 is actually owing to T2 shortening. With retraction of the clot, protein is also known to promote both T1 and T2 relaxation. In other words deoxyhemoglobin exhibits susceptibility but not relaxativity properties (46-48) (Fig. 63). As the metabolic status of the hematoma further declines to the subacute stage, deoxyhemoglobin is converted to methemoglobin: the iron is in the ferric state with one unpaired electron. This paramagnetic center is now also accessible to water protons, therefore promoting both T1 and T2 relaxation. Methemoglobin will appear as bright signal on T1 images; the T2 appearance depends on whether there has been lysis of the RBC. In the early subacute stage (first several days to a week), intracellular methemoglobin is still experiencing the same packaging susceptibility effects mentioned for deoxyhemoglobin and will therefore manifest as low signal (like air) on T2 images (Fig. 64). After cell lysis one would then expect the extracellular methemoglobin to allow dipolar relaxation to occur, thereby shortening both T1 and T2 relaxation times. On T1 it remains high signal; in fact, the T1 effect dominates at this stage, and with the lack of packaging susceptibility effect extracellular methemoglobin actually appears as high signal on T2 (Fig. 65). As more RBCs are lysed within the hematoma, it also becomes a very high-proton-density area with the released iron chelated by proteins such as lactoferrin and transferrin, all of which remain paramagnetic (49). Fig. 64. Increased T1 (left) and decreased T2 (right) signal representing intracellular methemoglobin from a patient with subacute pontine hemorrhage. Fig. 65. 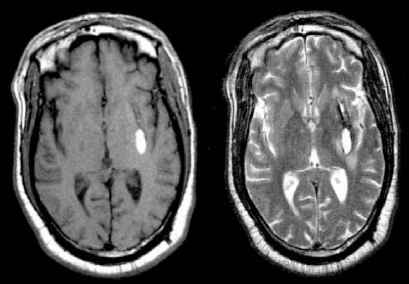 Axial T1 (left) and T2 (right) images both of which show increased signal at the left posterior basal ganglia from hypertensive bleed secondary to extracellular methemoglobin. Fig. 66. Same patient as in Fig. 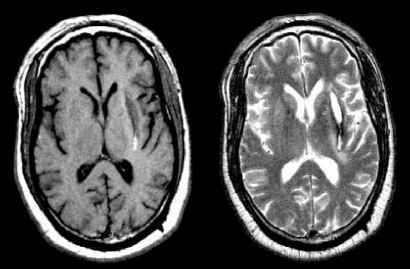 65 with older left anterior basal ganglia bleed showing CSF-like signal on T1 (left) and T2 (right) with a peripheral rim of dark hemosiderin. macrophages or glial cells (Fig. 66). From this discussion, one would expect the different stages to evolve from the center of the hematoma to the periphery, from oxyhemoglobin to deoxyhemoglobin to methemoglobin (intra- to extracellular), and finally to the chronic stage of hemosiderin. It is important to point out that these stages of hematoma apply to parenchymal bleed; hemorrhage in other compartments of central nervous system such as the subarachoid space and extraaxial locations will follow a different temporal evolution. This is partly owing to the different oxygen tensions in these nonparenchymal locations, which are suboptimal for the conversion of oxyhemoglobin to deoxyhe-moglobin to methemoglobin (46,47) (Fig. 67). 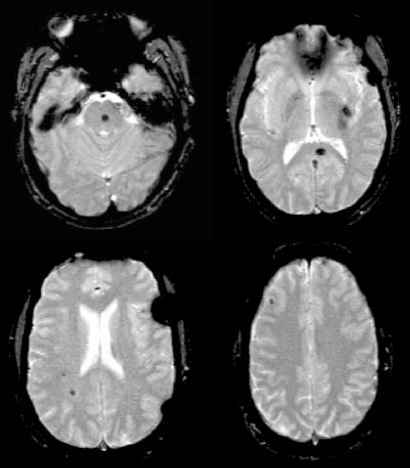 Subpial deposition of hemosiderin can arise from recurrent or chronic sub-arachnoid hemorrhage from tumor or vascular lesions that can appear as a thin dark line of "etching" along the surface of the brain and spinal cord (50). (Fig. 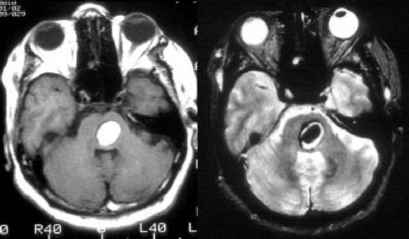 68) Another clinically important situation is the differentiation of a simple hematoma from one with an underlying cause such as a tumor or vascular lesion. A markedly heterogenous collection of signals owing to different stages of bleed that are not in the expected orderly concentric distribution, delayed evolution of blood products, a disrupted, absent, or irregular hypointense outer rim, and persistent surrounding edema all suggest an underlying lesion especially applicable to tumor (51) (Fig. 69). 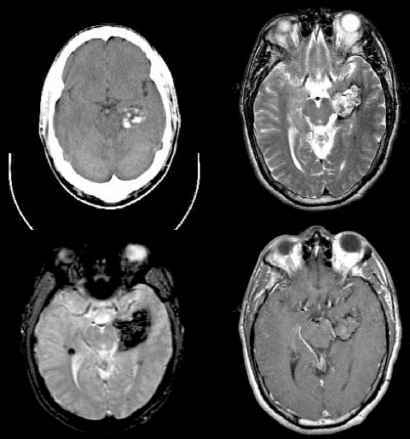 For some tumor and vascular lesions such as cavernoma, it is sometimes necessary to wait until the hematoma has resolved before the underlying lesion can be observed. Overall, a T2* susceptibility pulse sequence is used to detect small foci of hemorrhage whatever the cause that otherwise may be missed on all the other available MR pulse sequences (Figs. 61, 62, and 70).